Summary: The Ten Toes ISUP Inflatable Standup Paddleboard has found favor with the great majority of purchasers due to the quality of the product, the ease of inflation, the stability and safety whilst on the water and the ability to store and transport the board with ease. 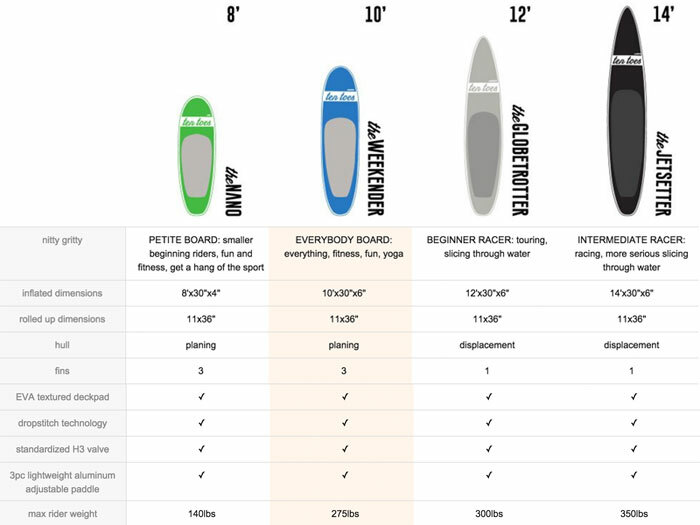 We take a look at the Ten Toes iSUP Inflatable Standup Paddleboard and tell you all about the good and less good points so you can make a sound decision on whether this board is for you. 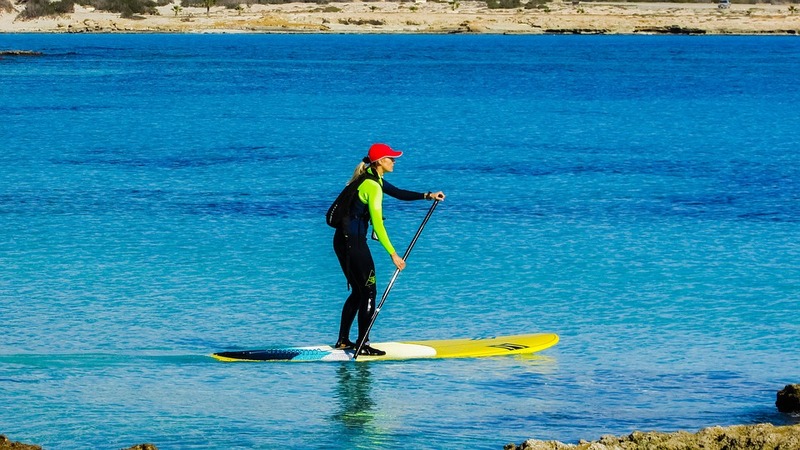 The Ten Toes iSUP Inflatable Standup Paddleboard is made from military grade PVC so is virtually indestructible and comes with a manufacturer’s 1-year guarantee. This board has received 75 reviews on Amazon US where it is one of their best sellers and has gained a 4.5 out of 5 star rating. 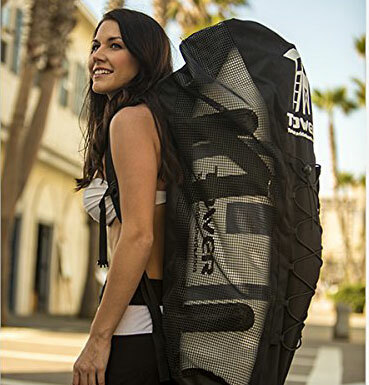 Most importantly, it all rolls up nicely to fit into the Ten Toes roller bag for the ultimate in providing activity and fun on the water without the difficulties associated with the transportation of solid boards. The Ten Toes iSUP Inflatable Standup Paddleboard can be rolled up into its carry bag and fitted into the trunk of a small family car. 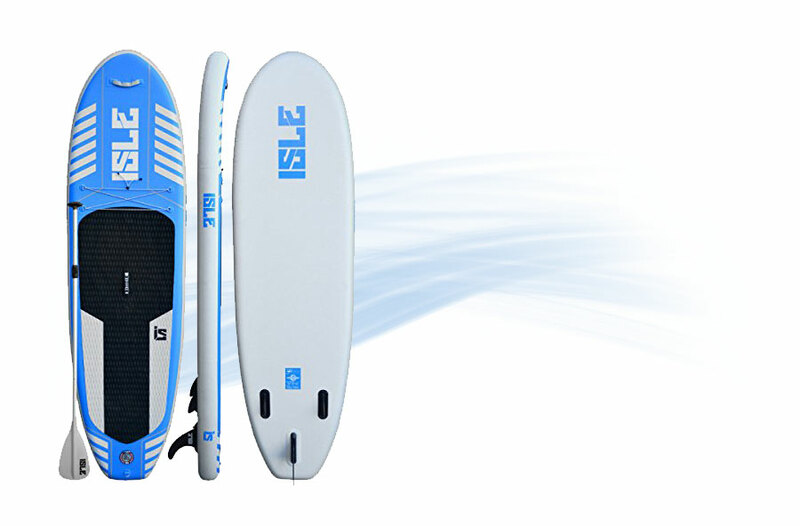 Are inflatable boards as good as solid boards? In the majority of situations the answer is yes. If a solid board hits a solid object (such as a rock), the board will chip. However the inflatable board will tend to bounce or glide off the obstruction and not suffer damage. The method of construction of inflatable boards is by using a drop stitch technique which provides the same sturdiness, stiffness, and dependability as traditional hard epoxy boards but it is more pliable, which means the board will probably last longer. Tens of thousands of thick strong threads hold the top and bottom base cloths together. This framework is covered in a multi-layer protective shell and then in a layer of military-grade PVC. 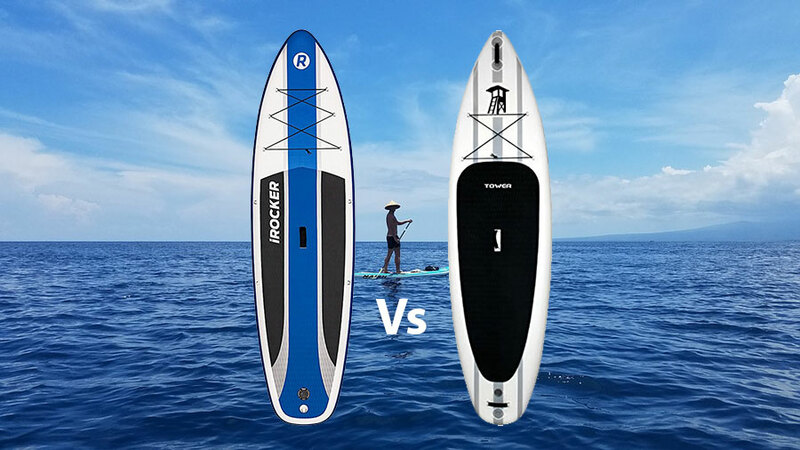 The manufacturers are so confident in this board that there is a one-year guarantee with the Ten Toes iSUP Inflatable Standup Paddleboard. 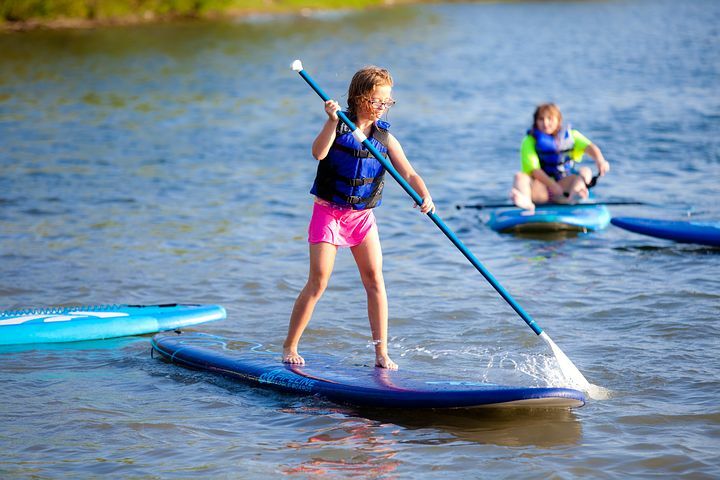 Paddle boarding is great exercise and kids really enjoy it as this is a cool new sport. The board can be carried on a roof rack when inflated so if you are going off to a new paddle boarding location this will save all the deflating/inflating time – more time on the water! Some people might think that an inflatable will not be as sturdy as a solid board but be ready to be amazed by this inflatable – it is really as rigid and sturdy as a solid board and in the very unlikely event that a leak should occur, a handy repair kit is included to make the board as good as new and get you quickly back on the water. When the board is inflated, there is a carrying handle which will make the journey to the water so much easier. The lightweight aluminium paddle is very efficient and is easily adjustable – should you ever let go, the paddle floats on the water so can be easily retrieved. When you have finished on your paddle board you can quickly and easily deflate it, once dry it can be rolled back up as you can see in the image below. It is very compact and can be put into a carry bag and drop straight into the back of your car. This board is suitable for all skill levels and ages and is stable enough for beginners to try this sport for the first time. 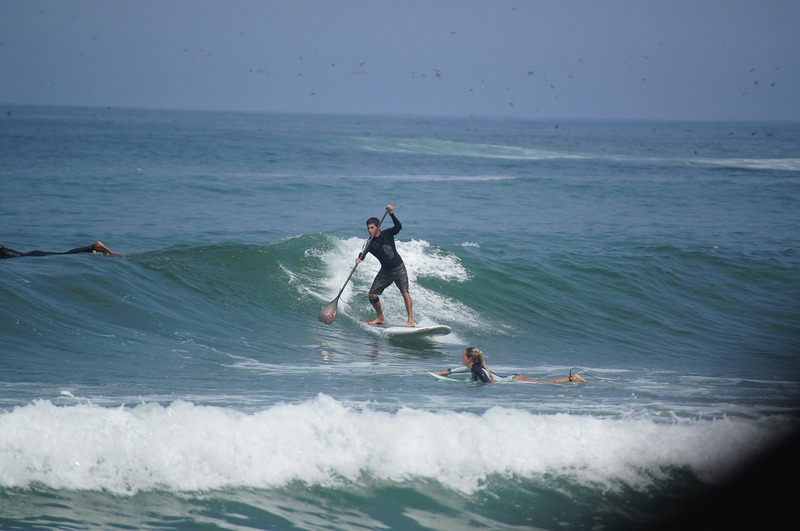 The board is very easy to steer and to maintain a course even in windy or swell conditions. 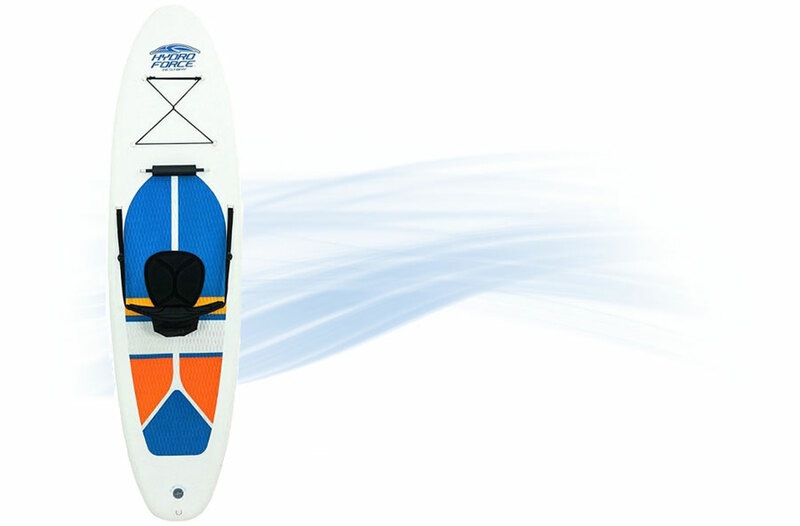 The board is ideal for kids and children as it is very stable, this also makes it great for beginners to, and perfect for SUP yoga out on the water. The light weight and the fact that it has an excellent storage bag make this board easy to take down to the waterside and inflate on the spot. Inflation takes about 10 minutes and is generally quite easy until the last part when the pressure is getting higher, but it is worth it. The below chart shows how this model stacks up against others in the range. This is a good allrounder and perfect for lazy Sundays out on the water. 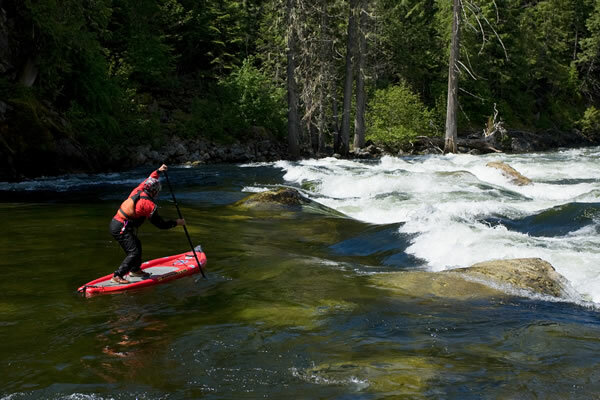 The 10′ Ten Toes iSUP Inflatable Standup Paddleboard is a good allrounder. 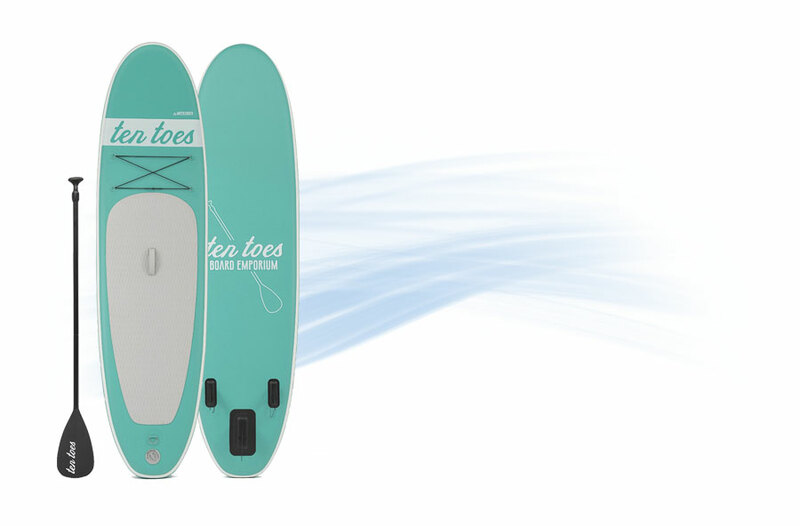 The Ten Toes Board comes with an indestructible iSUP, 3 piece adjustable & lightweight aluminium paddle which is easily connected together, 3 fins (many of its competitors only come with one fin), manual pump with an integral gauge so that the board can be inflated to the correct pressure and a repair kit. The board also comes with an additional deck pad. 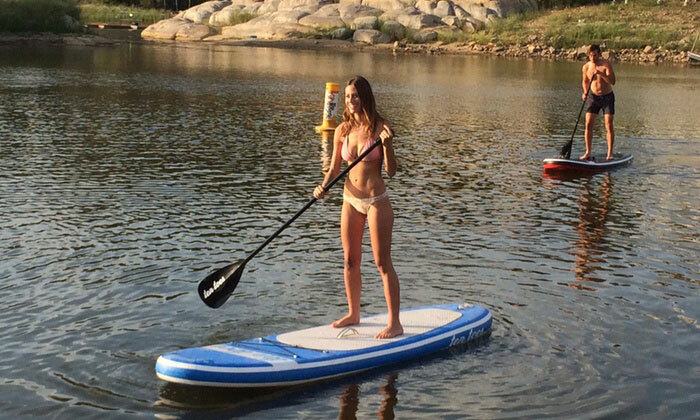 We round up the Pros and Cons of the Ten Toes Inflatable Standup Paddleboard. 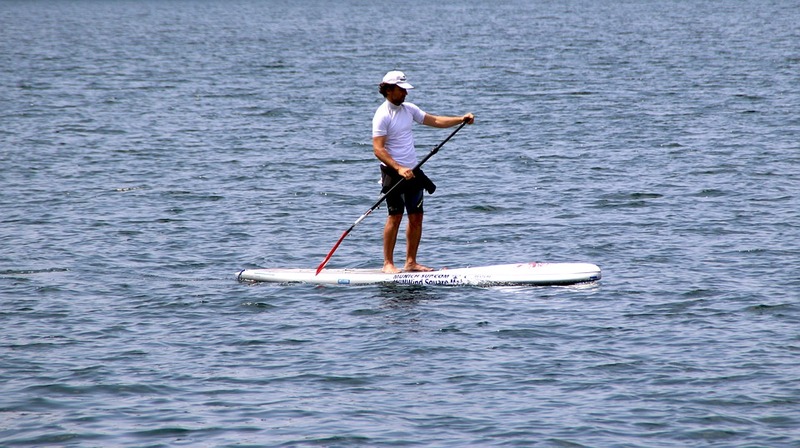 The board is brightly colored – visible to others on the water for safety. 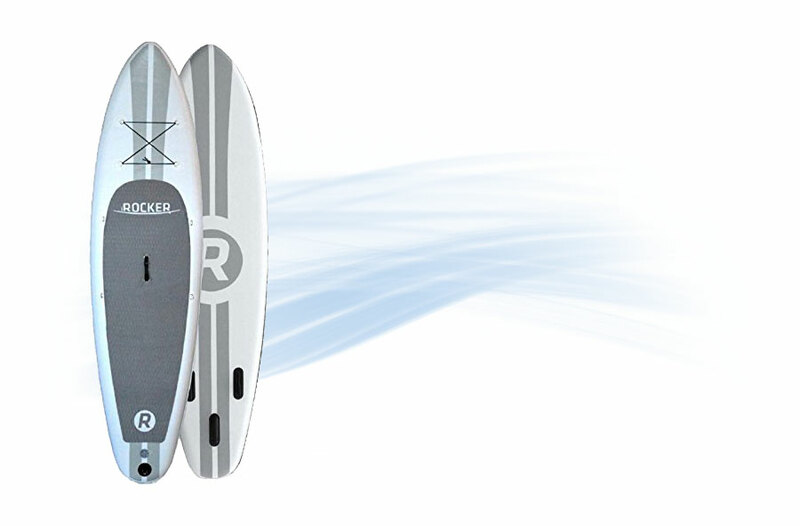 Good price – for entry level paddle boarding. Easy inflation – manual pump with an integral pressure gauge (and a handy repair kit) included. It can be difficult to get the board inflated to more than 14 PSI – sometimes the hose can get disconnected from the foot pump. 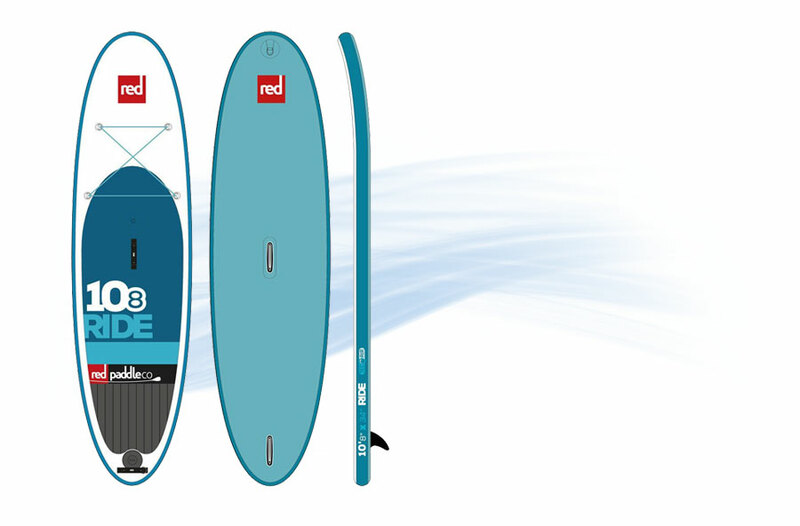 The Ten Toes ISUP Inflatable Standup Paddleboard has found favor with the great majority of purchasers due to the quality of the product, the ease of inflation, the stability and safety whilst on the water and the ability to store and transport the board with ease. However, it seems that when problems occur, there has been a widely differing response from the manufacturers to customer complaints; some reviewers say that their problems have been ignored whilst others are delighted with the positive response received in resolving their difficulties. Overall, it is evident that considerable thought has been given to the design of this board which is stable, easy to inflate and store in its roll up bag which will then take up minimal space either in the home or in the trunk of a car en route to the water. 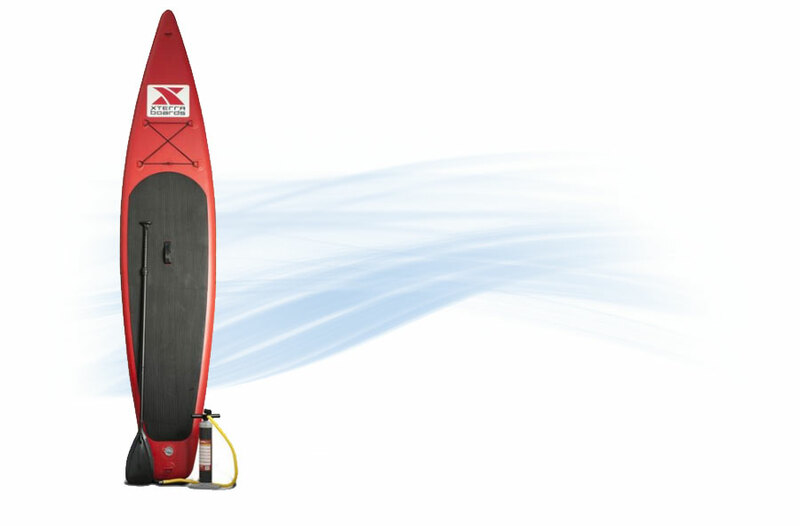 It comes with all the accessories you may need to go paddle boarding and it is quick to inflate and go paddling! It is marketed at a competitive price and it is worth serious consideration for both beginners and more advanced boarders; the product should give long service and great enjoyment for all ages.